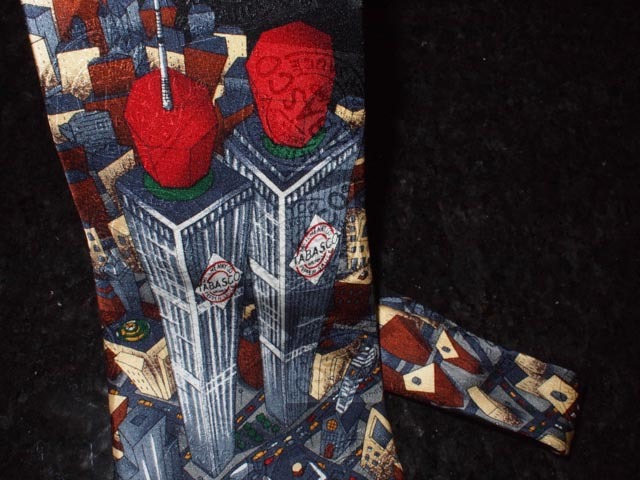 My husband hasn’t worn this tie since that day. I’m not one for looking backward. I generally don’t like history, and I’ve never been a fan of the “good old days” because in my eyes, those days weren’t any better. They were just different. In some ways, they were worse. I really enjoy having internet and the ability to communicate instantly, to anyone, anywhere in the world, something I didn’t have back in the ’80s. Today, though, is a special day. Not because it’s Hump Day or because it’s sunny out (though both are awesome qualities). Not because it’s a birthday, but because it’s an anniversary of something horrible: a piece of history that which will live on in my memories forever. I’m talking of course about 9/11. Strange, that a date should also be a name, and even a verb. I still remember exactly where I was, and what I was doing, as the towers were hit and the news broke. Ironically, it was my work anniversary. I’d been on the job 6 years that day. I was going to go out to lunch to celebrate. A group of us were gathered in my office, chatting about how time flies and generally sharing office type things. Gossip, complaints, excitements. Inconsequential things. Silly things that don’t matter but which grab our attention anyway. “Is what real?” We responded. We did. And we listened. And horror sank in as it became very, very clear that this was very, very real. We ran to the conference room and turned on the TV. Thus began a day of doing nothing but watching. Hearing. Waiting. Hoping. Crying. Time froze. Reality shattered. And everyone, everywhere in the US and across the world felt the ripples of those moments and that day. I remember how eerie the lack of sound was. The TV blared constant news updates, but outside the traffic died. No planes took off from DFW, which was only a few miles from my office. Planes sat on the runway and at the hangers. Idle. Derelict. Deserted. Like a ghost town. The streets which usually flooded at noon with people desperate for escape from cubicle land stood mostly empty. Parents left to pick up kids from school and go home, to huddle together as a family and watch some more. No work got done that day. Or the next. Looking back, I know one thing. I still don’t care what their point was in creating this destruction. Or even who “they” were, really. I’ve resolved to not even learn what they wanted, and to give them no space in my brain, because what they wanted doesn’t matter. Any point made with the murder of even one human soul, let alone thousands, is no point at all. It’s just murder. I noticed something last year when visiting New York City. They’ve rebuilt. New things are taking the place of broken things. There’s a softer side to the city now. A friendlier side. I notice people often greet me, a stranger, on the street. They sometimes smile, where they didn’t before. They’re more helpful. Is it a small town feel? Hardly. But a lot of the rough edges have smoothed over. So today I look back, and remember all those lives lost, and the lives gained, the good things that came from such a dark place. Tomorrow I’ll look forward again.